This morning was a sunny day and there was no new snow, so we decided to make a video today. Boris volunteered to be the camera man and eventually directed an epic that turned out to be bigger than Ben Hur in scope and length. We headed up the Kitanomine Gondola at the Furano Ski Resort(Hokkaido, Japan) a little after 9am and then skied down the Ladies’ Downhill course to the training run. We did that a couple of times and then headed over to the Furano side. The Furano side was a little bit choppped up already so we went up the ropeway and then I headed back over to the Kitanomine side. It was not worth venturing off-piste because there was a crust on the old snow and it would have been hideous trying to do anything. Hopefully it will snow again in a couple of days. The video of me above shows me walking up the hill to the ski-jo, going into the Tourist Information Centre to ask a staged question and then going up the gondola and skiing back down. It is really hard for me to watch myself in a video, it just seems really weird. I don’t like it much. Last night I went out to the second Japanese Cultural Night at the Ski-jo up the road(Furano, Hokkaido, Japan). The last one was a few weeks ago so I was looking forward to a good night out to see some genuine Japanese Culture. They have Calligraphy, Origami and Japanese Face Painting before the performance. The kids tried out some Calligraphy and painted the kanji for “friend” and “bravery”. About 6:45pm the first performance started. It was a Hyottoko Dance and it had been talked about by our Ski Hosts that day as being a “suggestive” dance. I did not know what to make of that and was a bit wary to be honest. The performers of the dance all had masks on. I think they were made from ceramic and looked very comical indeed. As far as I could tell, it was some kind of fertility dance to make the crops grow, I think. I just looked it up on Wikipedia and Hyottoko may have been a legendary figure that blew fire with a bamboo pipe. In Iwate Prefeture, the dance is reputed to bring good fortune. One of the most famous places for the Hyottoko dance is Miyazaki and the dance is believed to be as old as the Edo period. The next performance was Japanese Traditional Folk Music Min-yo by the Shishido Family. Min-yo are folk songs that are connected to forms of work or to specific trades. One song was called So-ranbushi and was sung by herring fishermen. Other min-yo are for the purposes of entertainment, accompaniment for a dance, or as part of religious rituals. Another song that the group performed was about the Ishidake River. Each area of Japan has its own distinctive style and songs. The group played the Shamisen, which is a three-stringed musical instrument, similar to a guitar, which is played with a plectrum called a bachi. The highlight of the night was me winning a bottle of Sho-chu in the lucky door prize. Last time I was very disappointed that I did not win a lucky door prize, so I was very excited. Sho-chu is a Korean drink that is twenty percent alcohol. Call it Korean rotgut. You have to drink lemonade or fruit juice with it to disguise the vile taste. It is the basis for the Chu-hi drinks which you can buy at the supermarket for about 120 Yen. They are a delicious grapefruit alchoholic drink. Typically the snow between the trees is a lot softer because it is out of the sun and wind and is not packed down as much as snow out in the open. Sometimes it is easier to see when you are skiing through the trees on whiteout days because the trees give contrast to the snow and you get better definition and you can see everything. These tips on how to ski trees come from Glen Plake. 1. Plan your route. Look down the tree line and have a general idea of where you want to go. Try and avoid small bushes. 2. Stand square and keep your head up. 3. Look Beyond the trees in front. See what is coming up and keep your eyes open to what is ahead. 4. Watch out for Dangers. Avalanches can happen in the trees. Watch out for stumps. 5. Ride with Someone. Have a buddy when you are skiing trees. Branches that can spear you. Tree wells often form around evergreens at the base and it can be difficult digging out of a tree well. Make sure that you can do short turns before attempting tree skiing. Do not go into trees late in the afternoon, because if you get lost, it may be hard to find you in the dark. Do not look at the trees, but look at the space between the trees. Your body tends to follow where you are looking. Make sure you have a buddy. Start with nicely spaced trees and work your way up to tight trees later. Two days ago we had a great dump of snow at Furano Ski Resort in Central Hokkaido, Japan. There was more than 20 centimeters of fresh powder and everyone was very keen to get up the hill early in the morning. I went up the quad chair at 8:30am and after a warm up lap down the beginner’s slope, I headed up the double and was second down the Giant piste. The Merewether boys were still doing up bindings and stuff and I just flew past them and down the piste to some lovely fresh powder on a nice flat base without all those horrible bumps underneath. After that run I headed across to the Furano side and on the way filmed some guys bouncing down the fresh pow through the trees. At some spots it looked about waist deep. 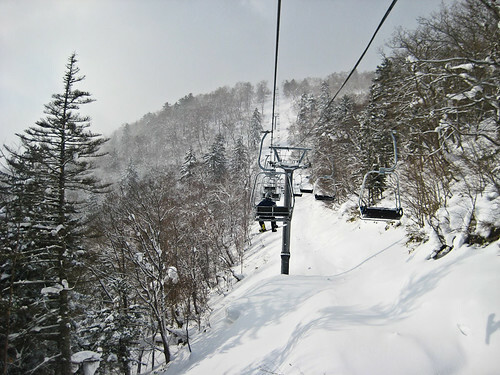 I had a few good runs to the left of the Furano Ropeway and then went up the double chair to the very top of the mountain and skied down the black run, which is on skier’s right from the top of the double. I cannot remember what I did after that. Yesterday I had a shocking day. The first run down the Ladies Downhill run was quite good but after that I had a shocker. I could not seem to do anything right and was feeling very incompetent. 🙁 Today I had the day off to recuperate and get stuck into it again tomorrow. There is some more snow coming in a few days, so that should be good. 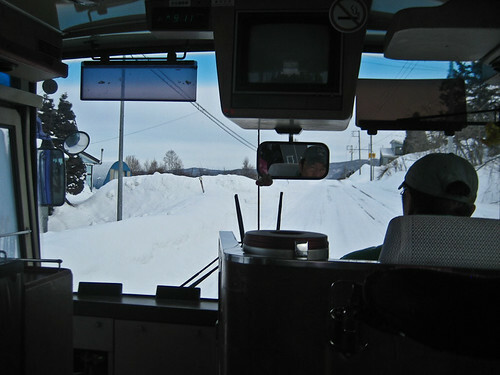 Yesterday we went on a bus trip from Furano to Kamui Ski Links. 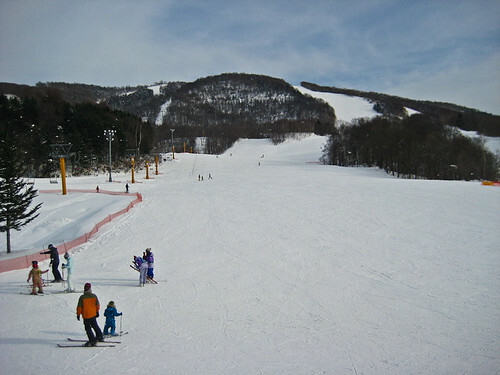 Kamui Ski Links is about 20 kilometers from Asahikawa in Central Hokkaido, Japan. We got on the bus about 8am and it took about an hour or so to get to Kamui. We arrived at Kamui about 9:30am and got our gear on and went up on the gondola. I followed along with a bunch of other guys to the far right of the resort. They took off down this gully but I wanted to warm up on the piste. I met them down the bottom of the ski lift later and then went up with them and followed them through the trees. The snow was a bit hacked up and bumpy but still a bit soft. I was not used to skiing through trees, so I had a few hairy moments when I thought I might have kissed a few fir trees. When we were going back I went down this hill through the trees and it was all icy and bumpy and I had a horror time falling off being generally incompetent. It shattered my confidence big time. I got down the bottom eventually, then went up the top for a lunch break. In the afternoon I just went down the pistes and took it easy. Today it was blizzarding at Furano and I did not think that the lifts would be working, but found out that the chair lifts and the ropeway usually work in a bit of wind. There was about 20 centimeters of fresh snow but it was a bit wet and heavy and I was struggling with it. 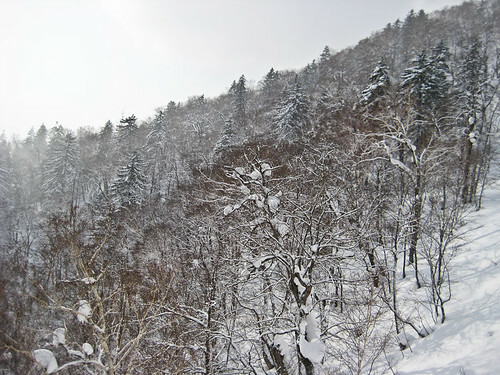 I went over to the Furano side and skied down the right hand side of the ropeway. Some parts were pretty good and other bits were chopped up and heavy in places. Mostly I was practicing my turns so I can be a bit more competent in rough conditions. All in all it was a good day with lots of new snow and I have made improvements in my turns. I was getting into unweighting between turns which seemed to help heaps. Hopefully it will continue snowing all week.